You are here: Home / Parenting Blog at KidsAintCheap / Money and Finances / How Do You Control Money Given To Your Kids? How Do You Control Money Given To Your Kids? In the past people have given money to our daughter. Sometimes there was explicit direction given with the money, like deposit it in her savings account, and other times there I have been told to spend it on whatever she wants or needs and so my husband and I have gone out and done just that. Usually putting the money towards a need more than a want, she’s only 2.5, she doesn’t have many wants. Now that she’s getting older though I will be allowing her to make some decision about how her money is designated. While I fully expect the first few times to be about buying the latest toy, it won’t stop me from explain the importance of saving some money too. If she does, great, if she doesn’t- it is her money. As she gets older I will stress the importance of saving more, but with some exceptions. Any income earned, like if she gets a babysitting job or part-time work doing something fun, I will fully expect that she contributes to her savings account and help save for something larger she may want or need, however I have no problem with allowing gift money to be spent however she wants. Most money given as a present is expected to be enjoyed. While I would like if she saved some or all of it I have no problem if she decided to blow it all on clothes, toys or whatever else she wanted as she gets older. AS long as it is an informed decision. If she empties her cash in a mall food court and couldn’t tell me where the money went, I’d have a problem but it would be 100% her mistake to make. If she convinced me she really wants something, and was given the money to buy something, I will totally allow it. At the same time if I notice after some time it’s something she isn’t using or was wasted money, depending on what it was, I would encourage her to sell it and regain some of the lost money. It’s easy for me as a personal finance blogger to get all too excited about saving and keeping all money tight to the vest but I can’t forget that money is meant to be enjoyed. For a three year old, long-term savings isn’t quite as fun as the newest Elsa doll or Olivia book and I get that, as long as she is really enjoys it isn’t money wasted in my eyes. I fully expect my children to make mistakes with their money. Mistakes made are often the best learning opportunities. I just hope most of the mistakes are made in the comfort of our family home before she moves out and has a full plate of financial responsibilities. Financial peace is about balancing wants, needs and responsibility as long as I can instill this, she should be just fine. 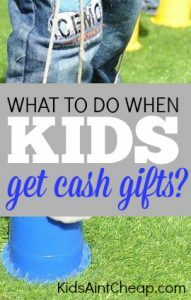 How do you decide how gift money given to your kids is ”spent”? Our daughter is just 11 months old, but we do plan on teaching her some very solid financial tips. She’d be prepared for adulthood, better than most of the people in my generation. Couldn’t agree more, you can’t start too young!